Jamie Grierson, Vikram Dodd and Jason Rodrigues, “Anjem Choudary convicted of supporting Islamic State,” Guardian (London), August 16, 2016, https://www.theguardian.com/uk-news/2016/aug/16/anjem-choudary-convicted-of-supporting-islamic-state. According to British authorities, Adebolajo was in part radicalized by the lectures of U.S.-born al-Qaeda in the Arabian Peninsula (AQAP) cleric Anwar al-Awlaki.Josh Halliday, “Lee Rigby ‘non-Muslim version of me’, Micahel Adebolajo tells court,” Guardian (London), December 5, 2013, https://www.theguardian.com/uk-news/2013/dec/05/lee-rigby-michael-adebolajo-court-woolwich. Adebolajo was born in the United Kingdom to Nigerian parents and raised in a Christian family.Cassell Bryan-Low, Benoit Faucon and Peter Evans, “Second Suspect in London Attack Named,” Wall Street Journal, May 25, 2013, http://www.wsj.com/articles/SB10001424127887324659404578502790328797014. He converted to Islam in 2003 during his first year of university,Vikram Dodd and Daniel Howden, “Woolwich murder: what drove two men to kill a soldier in the street,” Guardian (London), December 19, 2003, https://www.theguardian.com/uk-news/2013/dec/19/woolwich-murder-soldier-street-adebolajo-radicalised-kenya. and was reportedly tutored by extremist cleric Omar Bakri Muhammad. As early as 2006, Adebolajo attended protests led by al-Muhajiroun,Vikram Dodd and Daniel Howden, “Woolwich murder: what drove two men to kill a soldier in the street,” Guardian (London), December 19, 2003, https://www.theguardian.com/uk-news/2013/dec/19/woolwich-murder-soldier-street-adebolajo-radicalised-kenya. and was reportedly arrested that year for his participation in one of the group’s demonstrations. Nevertheless, Adebolajo is believed to have led some of the group’s protests in 2007 and 2009.“Footage of Woolwich suspect leading protest,” ITV News, May 29, 2013, http://www.itv.com/news/2013-05-29/new-footage-of-woolwich-suspect-michael-adebolajo-speaking-at-a-demonstration-in-2009/. Adebolajo reportedly attended events led by al-Muhajiroun and its successor groups until 2011, and later told British authorities that he left the group completely in 2012.Vikram Dodd and Daniel Howden, “Woolwich murder: what drove two men to kill a soldier in the street,” Guardian (London), December 19, 2003, https://www.theguardian.com/uk-news/2013/dec/19/woolwich-murder-soldier-street-adebolajo-radicalised-kenya. In October 2010, Adebolajo attempted to travel to Somalia where, according to British police, he planned to join the al-Qaeda affiliate al-Shabab. However, Adebolago was arrested by Kenyan counterterrorism forces before he was able to enter SomaliaSylvia Hui and Tom Odula, “Kenya: UK soldier killing suspect arrested in 2010,” Associated Press, May 26, 2013, http://bigstory.ap.org/article/uk-sets-task-force-target-radical-preachers. He later claimed that he was physically assaulted and sexually threatened by Kenyan officials during interrogations.Vikram Dodd and Daniel Howden, “Woolwich murder: what drove two men to kill a soldier in the street,” Guardian (London), December 19, 2003, https://www.theguardian.com/uk-news/2013/dec/19/woolwich-murder-soldier-street-adebolajo-radicalised-kenya. Adebolajo was transferred to British authorities and returned to the United Kingdom in November 2010.Vikram Dodd and Daniel Howden, “Woolwich murder: what drove two men to kill a soldier in the street,” Guardian (London), December 19, 2003, https://www.theguardian.com/uk-news/2013/dec/19/woolwich-murder-soldier-street-adebolajo-radicalised-kenya. 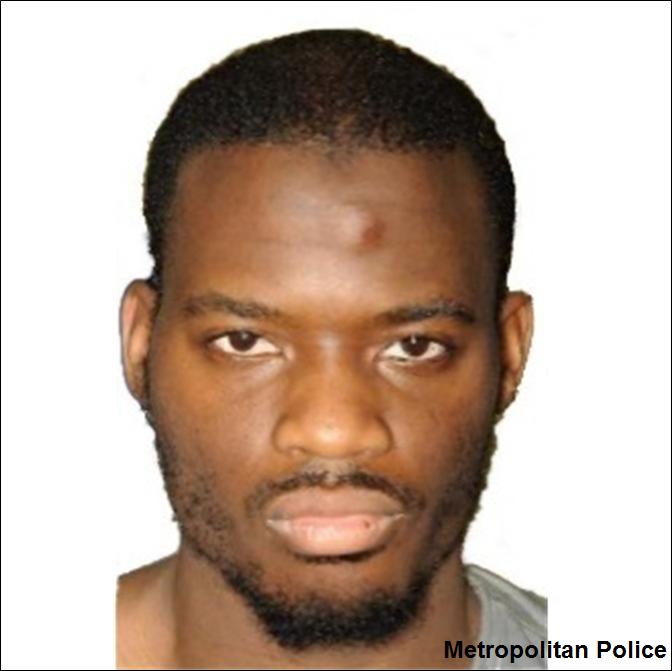 Adebolajo executed the May 2013 attack alongside British-Nigerian convert to Islam Michael Adebowale. Though Adebolajo and Adebowale were from the same neighborhood, police do not know when the men first met.Dominic Casciani, “Woolwich: How did Michael Adebolajo become a killer?,” BBC News, December 19, 2013, http://www.bbc.com/news/magazine-25424290. While there is little detail revealing how the pair planned the attack, Adebolajo told investigators that he had planned to target soldiers because soldiers already “have an understanding that [their lives are] at risk.”Vikram Dodd and Daniel Howden, “Woolwich murder: what drove two men to kill a soldier in the street,” Guardian (London), December 19, 2003, https://www.theguardian.com/uk-news/2013/dec/19/woolwich-murder-soldier-street-adebolajo-radicalised-kenya. CCTV cameras filmed Adebolajo purchasing a five-piece set of knives and a knife sharpener on May 21, 2013.“Fusilier Lee Rigby trial: Prosecution key points,” BBC News, November 29, 2013, http://www.bbc.com/news/uk-25152141. On the afternoon of May 22, 2013, Adebolajo and Adebowale hit Lee Rigby with a car traveling at 30-40 mph as the off-duty soldier walked to the Royal Artillery Barracks in London.“Lee Rigby murder: Adebolajo and Adebowale jailed,” BBC News, February 26, 2014, http://www.bbc.com/news/uk-26357007. Adebolajo and his co-conspirator then dragged Rigby into the street and stabbed him with a knife and a meat cleaver, reportedly shouting jihadist rhetoric. “Woolwich Suspects ‘Known To Security Services,’” Sky News, May 23, 2013, http://news.sky.com/story/woolwich-suspects-known-to-security-services-10445014. Both assailants stayed at the crime scene, reportedly awaiting the arrival of law enforcement.Vikram Dodd and Daniel Howden, “Woolwich murder: what drove two men to kill a soldier in the street,” Guardian (London), December 19, 2003, https://www.theguardian.com/uk-news/2013/dec/19/woolwich-murder-soldier-street-adebolajo-radicalised-kenya. Adebolajo launched into a speech in which he justified his actions and expressed his desire to be martyred, which was captured on a witness’s mobile phone.Dominic Casciani, “Woolwich: How did Michael Adebolajo become a killer?,” BBC News, December 19, 2013, http://www.bbc.com/news/magazine-25424290. As police arrived to the scene, Adebolajo and Adebowale charged at the officers while brandishing their weapons. They were shot by police and taken into custody before they were admitted to the hospital and treated for their injuries.Cassell Bryan-Low, Benoit Faucon and Peter Evans, “Second Suspect in London Attack Named,” Wall Street Journal, May 25, 2013, http://www.wsj.com/articles/SB10001424127887324659404578502790328797014. In the subsequent investigation, police recovered extremist literature from addresses linked to Adebolajo and Adebowale, including sermons by Anwar al-Awlaki.Josh Halliday, “Lee Rigby ‘non-Muslim version of me’, Micahel Adebolajo tells court,” Guardian (London), December 5, 2013, https://www.theguardian.com/uk-news/2013/dec/05/lee-rigby-michael-adebolajo-court-woolwich. During the trial, it was revealed that a book titled Extreme Islam was found at the home of Adebolajo’s father.Josh Halliday, “Lee Rigby ‘non-Muslim version of me’, Micahel Adebolajo tells court,” Guardian (London), December 5, 2013, https://www.theguardian.com/uk-news/2013/dec/05/lee-rigby-michael-adebolajo-court-woolwich. In June 2013, Adebolajo was charged with the murder of Lee Rigby, as well as the attempted murder of two police officers and possession of a revolver. “Woolwich murder suspects remanded in custody,” BBC News, June 3, 2013, http://www.bbc.com/news/uk-22748021. Adebolajo pled not guilty to the murder, but did not deny taking part in the attack.“London court convicts Michael Adebolajo and Michael Adebowale of murdering U.K. army drummer Lee Rigby,” CBS News, December 19, 2013, http://www.cbsnews.com/news/michael-adebolajo-michael-adebowale-convicted-london-murder-lee-rigby/. Adebolajo was convicted of murder on December 19, 2013, but was cleared of the charge of attempted murder of the two police officers. The jury took only 90 minutes to deliberate and find him guilty.Laura Smith-Spark and Kellie Morgan, “What led Michael Adebolajo and Michael Adebowale to murder Rigby?,” CNN, December 19, 2013, http://www.cnn.com/2013/12/19/world/europe/uk-soldier-killing-profiles/. During Adebolajo’s sentencing in February 2014, the judge identified him as the leader of the attack, sentencing Adebowale to 45 years in prison and Adebolajo to life in prison.“Lee Rigby murder: Adebolajo and Adebowale jailed,” BBC News, February 26, 2014, http://www.bbc.com/news/uk-26357007. Mujahid Abu Hamza“Woolwich murder suspects remanded in custody,” BBC News, June 3, 2013, http://www.bbc.com/news/uk-22748021. Michael Adebolajo and Michael Adebowale are British citizens convicted for the May 2013 murder of British soldier Lee Rigby. “The only reason we have killed this man today is because Muslims are dying daily by British soldiers. And this British soldier is one. It is an eye for an eye and a tooth for a tooth. By Allah, we swear by the almighty Allah, we will never stop fighting until you leave us alone. So what if we want to live by Sharia in Muslim lands? Why does that mean you must follow us and chase us and call us extremists and kill us? Rather, you lot are extreme.”“Transcript of Woolwich killer speech: ‘it’s an eye for an eye,’” Times (London), May 23, 2013, http://www.thetimes.co.uk/tto/news/uk/crime/article3772760.ece.